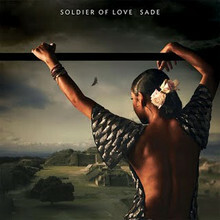 Though it’s been ten years since Sade's last release, their new album (yes, it’s a group) Soldier of Love preserves the sound that makes them one of the UK's most successful soul and R&B acts ever. Since the 1984 classic Diamond Life, Sade Adu's uniquely impassioned voice, the softly chilling instrumentals, and emotive harmonies separated them from contemporaries within a style known as "Quiet Storm era," named after the band’s ubiquitous hit. Excluding the noted changes, the album could have been released at any point during the group's career. This is undeniably favorable for existing fans, but it begs the question: Is it wrong to continue making music that's proven successful and remains entirely unique or does it become gimmicky? There is no right answer, but while Solider of Love will warm and sooth the hearts of existing fans, it might feel dusty to followers of contemporary queens like Lady Gaga, Rihanna and Beyonce.